Beautiful clear glass, pressed in a sawtooth design with pointed ribbed side, form the perfect base for this lovely 8-3/4" covered heart-shaped box. 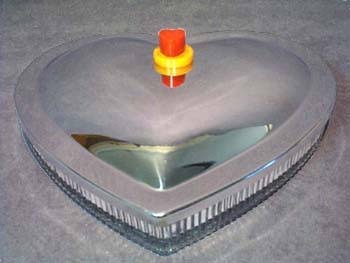 The fitted chrome top is accented by a rich butterscotch bakelite ribbed base for the vivid ruby red bakelite heart knob. There are a couple of very tiny nicks that are known by feel rather than sight on the rim of the glass, which make this romantic beauty all but perfect.